A demo is a program that shows off the abilities of a computer or programmer, sometimes even beyond the limits of an original architectural design. For example, a well-known demo theme on the Commodore 64 consists of rendering sprites in the border, i.e. outside the area originally destined for rendering sprites. This tutorial presents demos that use the LED display beyond its (probable) original purpose: adjusting the brightness of characters or even segments. As shown in the previous tutorial, a refreshing loop is necessary to show all 6 characters on the LED display. Here, the refreshing rate directly defines the brightness of these characters. Simply looping around yields maximum brightness, while lowering the refresh rate dims the screen. This idea can also be used to adjust the brightness of parts of the LED screen (characters or even individual segments within the characters). The following schematic illustrates what is fun about retro computing: the complete schematic of a microcomputer fits on a single page (a higher resolution PDF can be downloaded from the Briel Computers website). 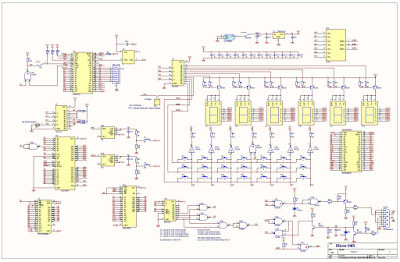 The schematic shows that the 6 character LED display is controlled through some selection logic by the data ports of the 6532 RIOT. 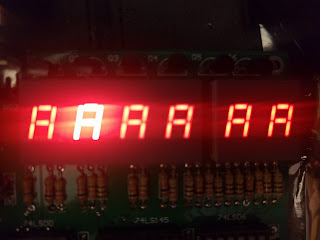 Because the 16 pins of the two 8-bit data ports A and B would not have sufficed to control all characters in the LED display simultaneously, instead a few bits of B select one character (value 9 selects the first, value 11 the second, etc.) while the lower 7 bits in A are used to control the 7 segments of that particular character (bit 0 controls the top segment, bit 1 upper right segment, etc. ).